The Elsie Richards Scholarship Fund provides funding for low income residents to learn how to sew. To provide tax-deductible donations specifically to this scholarship (as opposed to our general donation fund), please click on the “donate” button below. Thank you for your support! 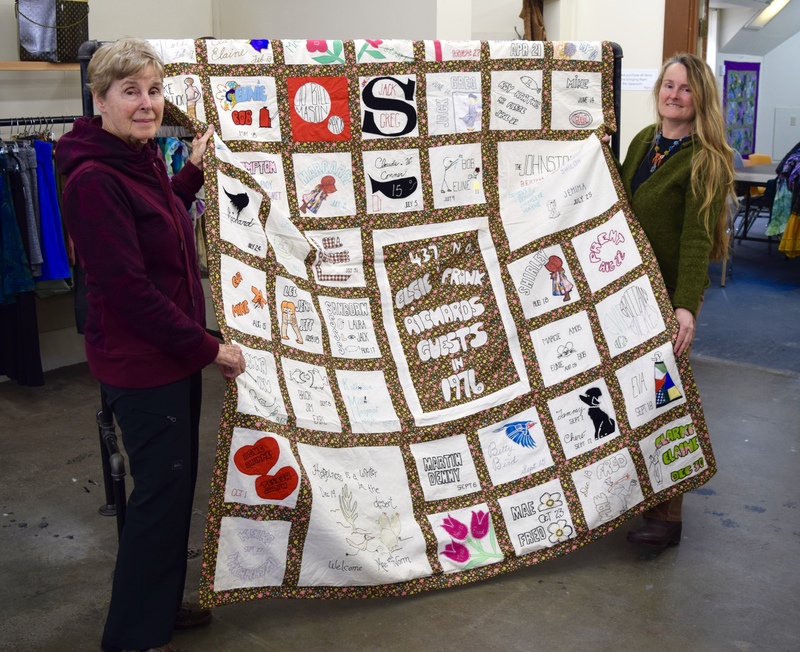 Lee Cole and Jeni Cottrell holding a quilt made by Elsie Richards capturing stories from over 400 visitors in one summer. Bellingham artist Jeni Cottrell and her mother Lee Cole partnered with Ragfinery to create this scholarship to provide opportunities for low income residents to learn how to sew. The Elsie Richards Scholarship Fund, named in honor of Cottrell’s grandmother and Lee’s mother, allows selected applicants to participate in Ragfinery’s “Sewing Bootcamp” workshops at no cost. Elsie Richards was a life-long fiber artist who ran a tailoring and alterations business in Vancouver, BC. Jeni felt the scholarship would be a great way to honor her grandmother and promote sewing, and because of the combination of Ragfinery’s mission providing job training to low income populations and their role as a community hub for textile arts, workshops, and craft materials, she thought they would be an ideal business to partner with for the scholarship.